Every once in a while, we like to break away from the purely digital entertainment thing and throw down with a little old-school, analog board gaming. One of our family favorites is the outstanding “Ticket to Ride” series by Days of Wonder. The only problem with analog? It totally doesn’t fulfill my deep-seated, borderline compulsive need for detailed statistics and progress tracking (known by my family colloquially as “Dad’s rub-it-in-your-face sheets”)! 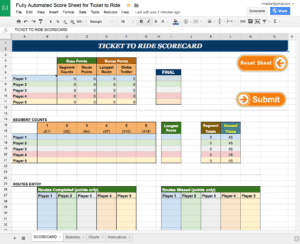 This fun project actually started out as a “proof of concept” for my local school district of what was possible in Google Sheets. In the end however it was nearly as much fun for me to create and get the calculations “just so” as it was to play the game itself! Anyone who has played TTR will immediately see the value in not having to chase little wooden pieces around while playing, double and triple-checking people’s addition, or verifying that all of the trains are still present either on the board or in a bag – this sheet will do all of that for you. I also included a few of what I considered the most relevant graphs and charts, though I’ve heard from other players that I’m missing a few important ones. Let me know what I can add in the comments here. I invite you to check it out, download it, improve it, etc … have fun! Don’t forget you’ll need to approve the scripts for the calculations to work properly.